Sample pages have been provided from each edition (click on the highlighted titles to view). These are copyright, and are not necessarily indicative of the standard of difficulty of the whole edition. Some audio samples have been added to this page. These works by Handel were arranged for organ by Pastor de Lasala, though the Concerto grosso movement will also work on harpsichord. 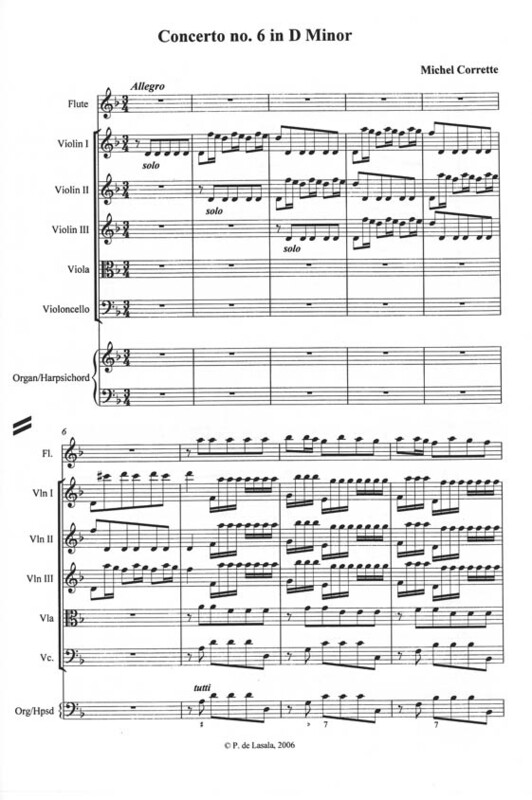 The repertoire is suitable for performance at weddings and other functions. 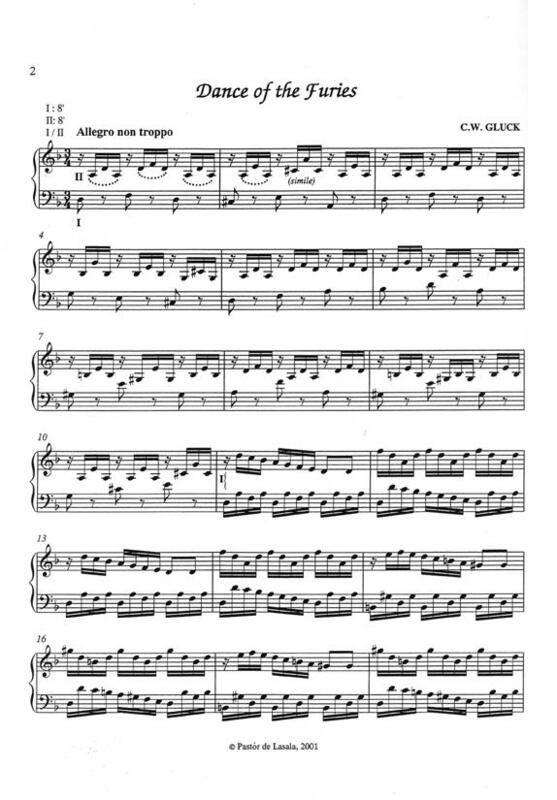 These three pieces: Caprice, Le Tombeau de M. de Ste Colombe, and Le Tourbillon were arranged for organ from Marais' Pieces de Violes. The Tombeau uses the Tierce en taille registration to great effect. Arranged by Pastor de Lasala. YouTube video of the editor performing Le Tombeau de M. de Ste Colombe. 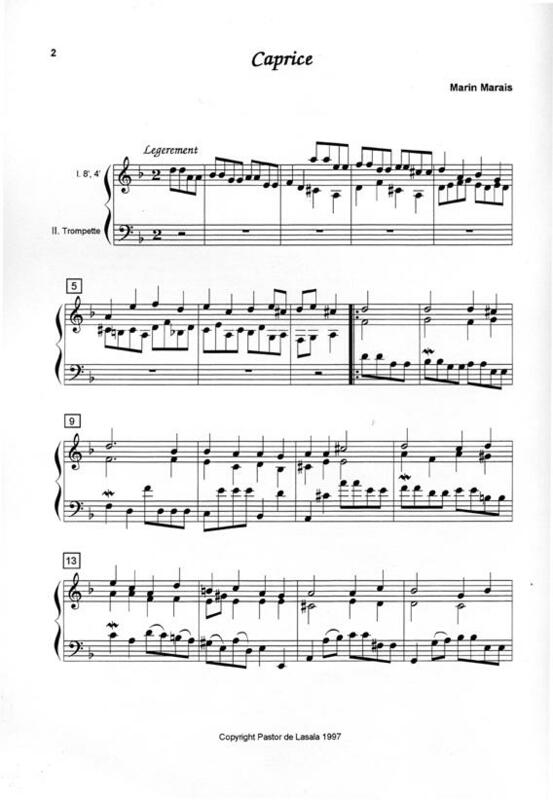 Rosalind Halton discovered this Toccata hidden in a manuscript and this is its first edition. 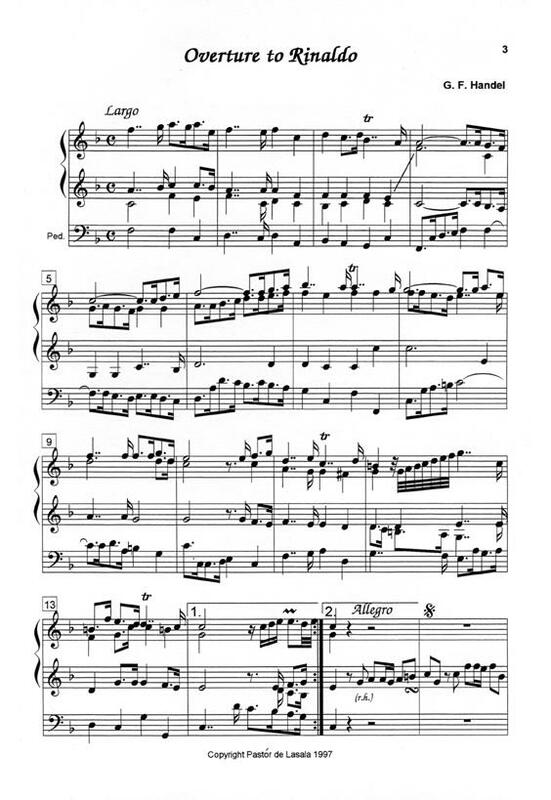 It's an excellent piece which stands up very well against the better known Toccatas by this composer. A must for every serious harpsichordist. These three Mozart Church Sonatas, K. 67, 225 and 245 have been arranged for organ by Pastor de Lasala. One of Saraband Music's best selling items. YouTube video of the editor performing the Church Sonata in Eb. See above for another video of a D major Church Sonata. 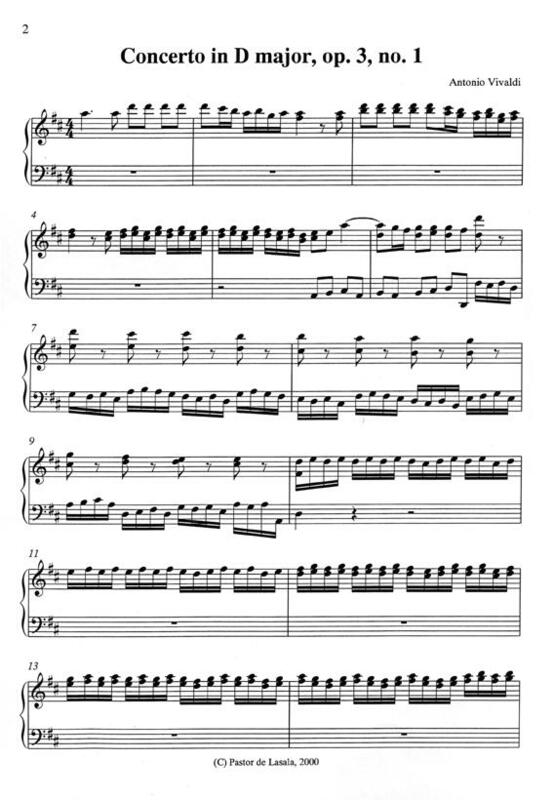 Originally a concerto for two cellos, this piece has been arranged for harpsichord or other keyboard instruments by Pastor de Lasala. 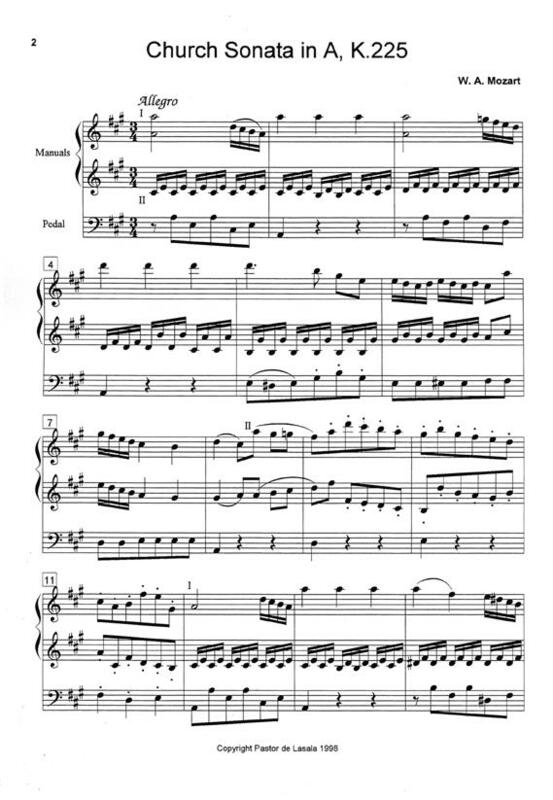 A great piece, and while it looks virtuosic in places, it isn't quite as hard as it looks. J.S. 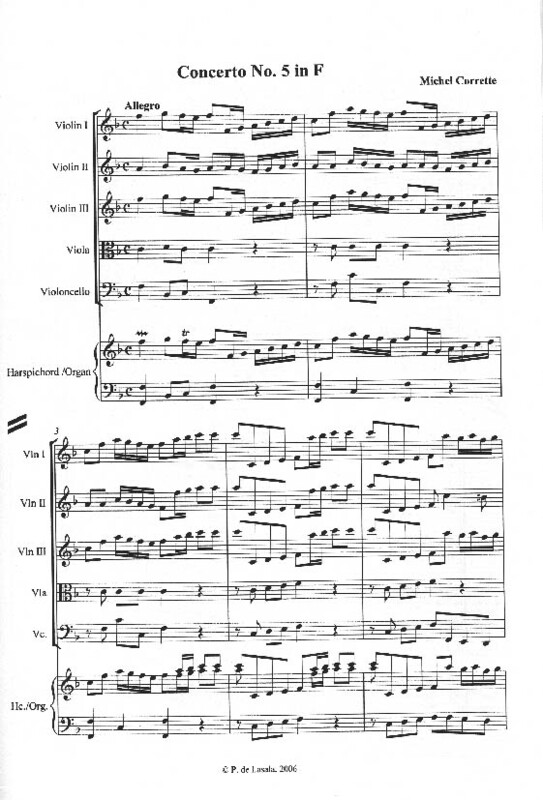 Bach arranged half of the concertos from Vivaldi's opus 3 for other instruments. Here Pastor de Lasala has arranged for organ, three of those which Bach missed. They do not require virtuoso technique, and are suitable repertoire for a range of occasions. Arranged for harpsichord by Pastor de Lasala, another piece which looks harder than it is. A dramatic piece, it would work well in a concert program. The six keyboard concerti which can be performed on organ or harpsichord are presented in a new edition by Pastor de Lasala, with a Preface written by Yves Jaffres (author of the important biography of M. Corrette, published by Saraband Music). The edition is bilingual (English and French). These extremely pleasant concerti are very accessible to both audiences and players, and show quite an Italianate influence. Each concerto would be suitable for student orchestra use. The solo part is not too difficult, and certainly within the range of a talented school student. The instrumentation for this Concerto is Keyboard solo with Violins 1-3, Viola and Cello. 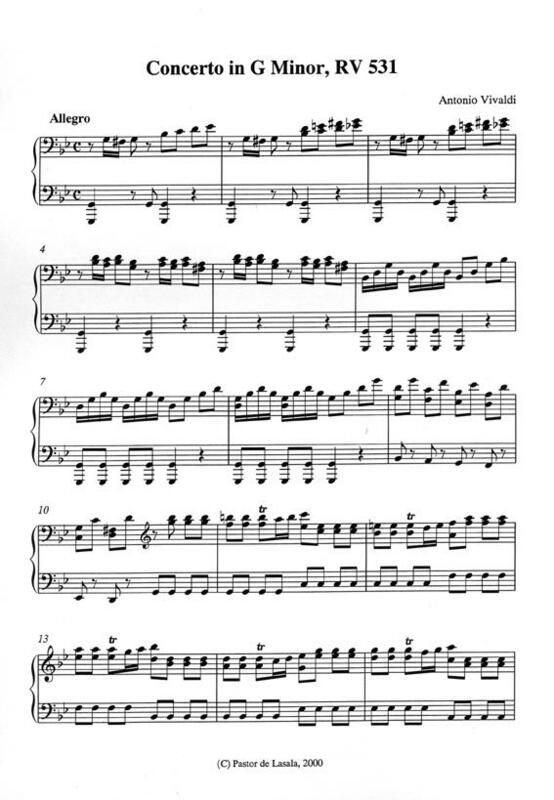 The keyboard part could be played as an unaccompanied solo, so it is available separately. Orch. string parts are issued in a minimum set of 3, 3, 3, 2, 2. 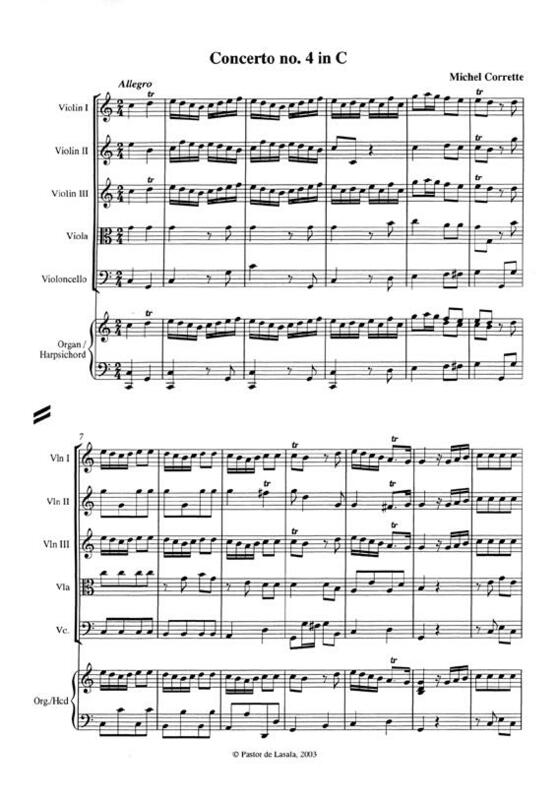 For larger orchestras, double sets are available, or you may request a set for your needs. 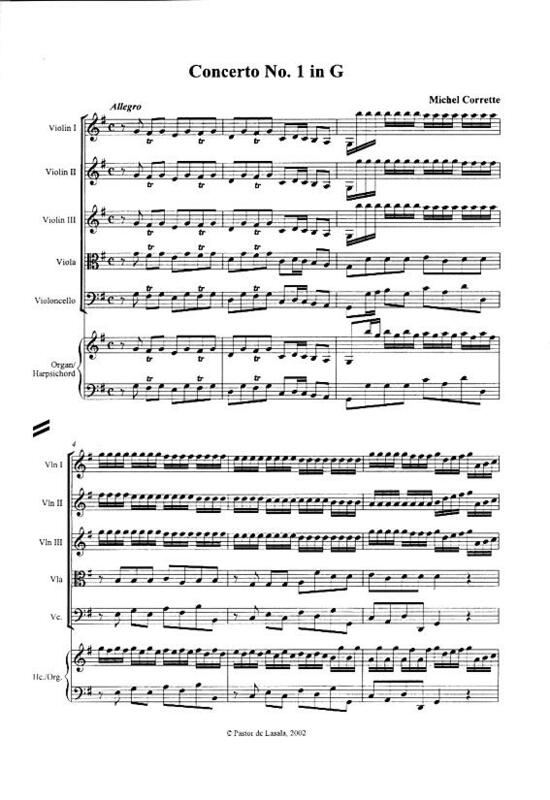 Youtube video of the editor performing the Gigue. 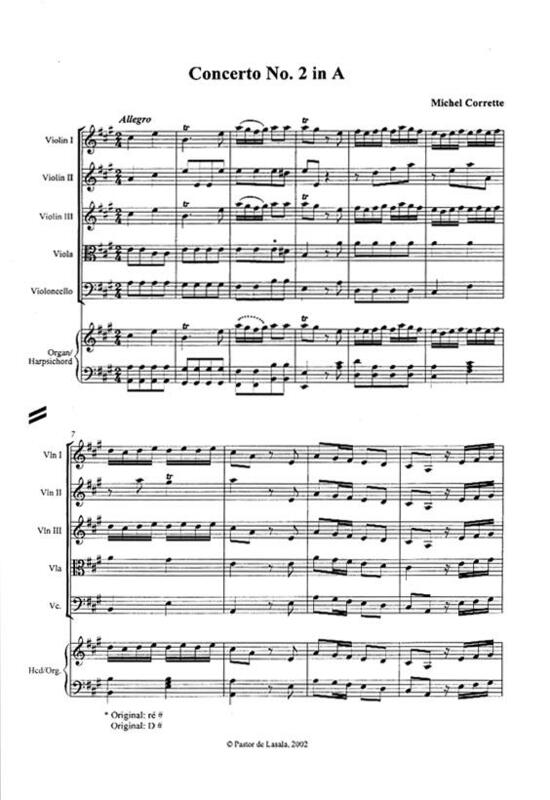 Concerto no. 3 in D differs slightly from the first two. 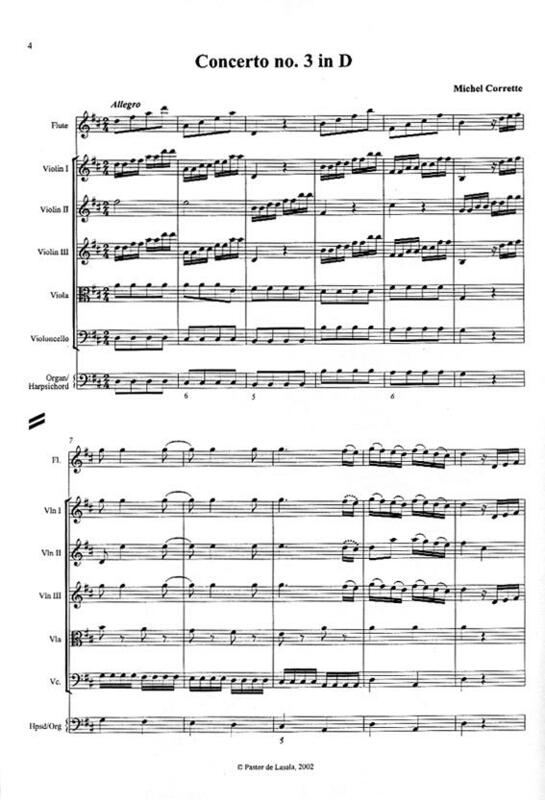 It adds a flute to the orchestra, and the keyboard solo part is largely a realisation of a figured bass part. 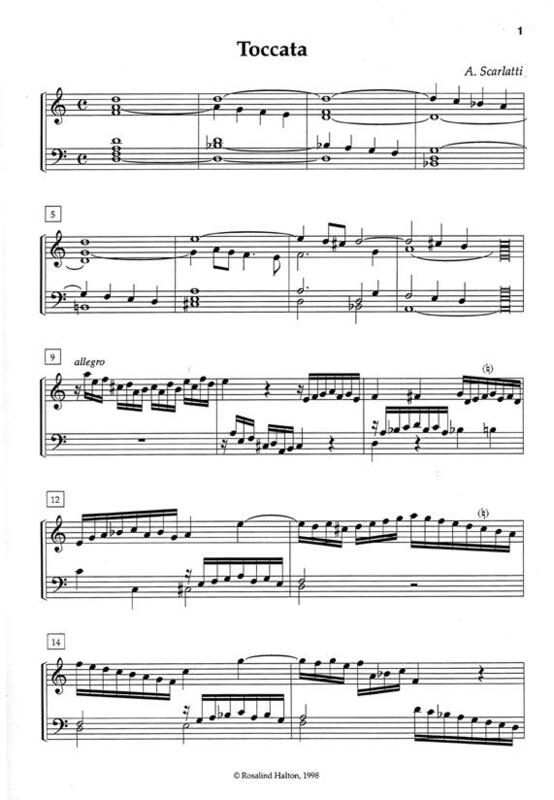 For this reason, the keyboard part is not available separately from the complete set as in the first two concerti. The instrumentation for this Concerto is Keyboard solo with Flute, Violins 1-3, Viola and Cello. Like Concerto no. 3, no. 6 adds a flute to the orchestra. The instrumentation for this Concerto is Keyboard solo with Flute, Violins 1-3, Viola and Cello.